CALGARY – Alberta’s got a new top trial court judge along with a freshly minted second-in-command. And for the first time they’re from the same city – Calgary. 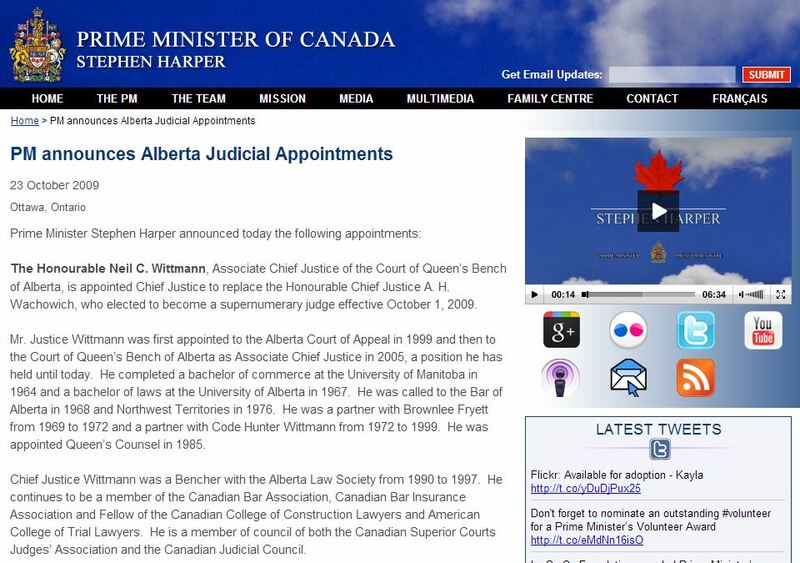 Prime Minister Stephen Harper today announced Court of Queen’s Bench Associate Chief Justice Neil Wittmann will take over for outgoing Chief Justice Allan Wachowich. Wachowich, from Edmonton, elected to become a supernumerary judge effective Oct. 1, meaning he will no longer sit full time. To replace Wittmann as associate chief, Harper announced Calgary Justice John Rooke will take that position. Wittmann said he’ll discuss with Rooke, who was out of town, whether his second-in-command will be moving up north, or remain a sitting Calgary judge. “We’re going to get together early next week and work out the logistics of these things,” he told the Sun. Having Rooke remain in Calgary “would be very difficult and present a lot of problems functionally,” he said. Traditionally, the chief and associate chief judges have come from different cities, Wittmann acknowledged. “I have not heard of a situation, or can’t remember a situation, where there was an associate and a chief justice appointed from the same city, so I think it’s unprecedented,” he said. “In Alberta we are unique, geographically,” Wittmann said, in reference to the fact the province has two major cities of similar size to fill those positions. Wittmann said it’s both an honour and great responsibility to take over as chief. He said his greatest task will be balancing the need for a streamlined system with one which guarantees fairness for those who rely on it. “Most cases … are getting more complex and complexity sometimes leads to greater length and greater length leads to strains on our resources,” he said.